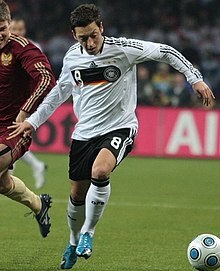 ↑ "Mourinho: Ozil will make history at Real"۔ ESPNSTAR.com. 26 مئی 2012. Retrieved 26 مئی 2012. ↑ "German international Ozil joins Arsenal"۔ Arsenal F.C. 2 ستمبر 2013. Retrieved 2 ستمبر 2013.